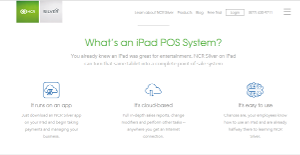 NCR Silver is a point-of-sale (POS) system that is hosted on the cloud and developed specifically for the Apple iPad. Created by the first POS systems provider, NCR, the NCR Silver POS system leverages the simplicity and ease of use of the iPad, enabling users to run their POS-related functions including employee management, inventory management, scheduling, sales reporting and more from a convenient, versatile device. There is no need to purchase and set up bulky sales counters and registers for your stores. You do not have to install any software on your server. With NCR Silver POS, you can take payments, access sales reports, run your business and more from the cloud via your iPad. NCR Silver POS lets you take control over your business, from managing and scheduling your employees to accepting payments, tracking sales, and more with just your iPad. NCR Silver has proven to be quite successful in meeting the needs of small, independent retailers who are in need of a versatile point of sale system that is intuitive, simple and straightforward. Whether you are running a brick and mortar store or an online merchant selling products over the Internet, NCR Silver POS handles all your requirements and more with ease. The system comes integrated with sales and inventory tracking capabilities, ensuring you are always aware of product movement and notified when your stocks are low and you need to replenish. You can also manage your employees, from attendance to leaves to schedule. NCR Silver provides you with a simple platform that makes manning your business easy and fast. In terms of payment, your customers can pay over the cloud, which is great especially if you are selling your products online or even on-site at trade shows and business events. Remaining connected with your customers is essential for any business endeavor and NCR Silver helps you remain in touch with your clients. You can create and send custom messages regarding deals, specials, and other promotions. As the system is based in the cloud, you can access and manage your business from anywhere and anytime. Every business is different, and can need a particular type of POS Software solution that will be designed for their company size, type of clients and staff and even specific industry they cater to. You should not count on finding an ideal app that is going to work for each business no matter what their background is. It may be a good idea to read a few NCR Silver reviews first and even then you should keep in mind what the service is intended to do for your business and your workers. Do you need an easy and straightforward app with only essential features? Will you really make use of the advanced functionalities required by experts and big enterprises? Are there any particular features that are especially useful for the industry you operate in? If you ask yourself these questions it is going to be much easier to find a reliable solution that will match your budget. We realize that when you make a decision to buy Restaurant Management Software it’s important not only to see how experts evaluate it in their reviews, but also to find out if the real people and companies that buy it are actually satisfied with the product. That’s why we’ve created our behavior-based Customer Satisfaction Algorithm™ that gathers customer reviews, comments and NCR Silver reviews across a wide range of social media sites. The data is then presented in an easy to digest form showing how many people had positive and negative experience with NCR Silver. With that information at hand you should be equipped to make an informed buying decision that you won’t regret. What are NCR Silver pricing details? What integrations are available for NCR Silver? If you need more information about NCR Silver or you simply have a question let us know what you need and we’ll forward your request directly to the vendor.